In restaurants, while riding in the car, or spending time at home, kids are watching TV or videos, playing video games, or using mobile devices. You may have the feeling in the back of your mind, that this can’t be all good. So, what do the experts recommend? The AAP (American Academy of Pediatrics) recommends no screen time, except for video chatting, for babies up to 18 months. 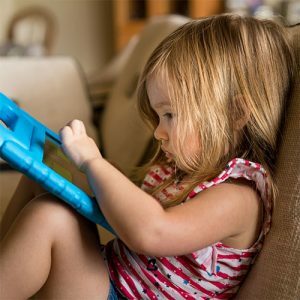 It recommends limiting preschoolers to an hour a day of screen time. This recommendation may shock you because you know that most children are logging much more screen time than this every day.